Friday the 13th! Quick, a Craft! Who could waste a perfect title like that? Great time to share a quick craft with you too. It’s easy, low cost and fun to do! See the “TO DO’s” HERE and HERE. Find LOTS Fall projects by going up to the search bar & typing in the following words (one at a time) . Whatever you do, don’t stress out … just start! Here are some last minute, EZ=PZ’s for tomorrow! Look for much more frequent posts in the weeks to come. Valentine’s Day isn’t the elaborate celebration it once was, around our place. It’s more of a “stay home and snuggle” than a “reservations and retail” type of holiday, after being married for 31 years . We kind of like it that way … especially in a freezing February! So, it was unexpected (and sort of cute) when, while shopping this week, Hubs wanted me to pick out something for a Valentine gift. An obvious starting point was the display of mixed bouquets. There were three different prices and assortments presented. Now, don’t get me wrong, many of the choices were fresh enough, that one may have worked. But remember I’m a former florist, so I looked them all over closely. Still, those prices for something that would be gone in a few days gave me pause. I wanted to keep looking. We went back to the normal garden department and while the variety and choices were very limited, there was a good sized foliage plant I liked, for a bit more than the flowers. Similar price points. Live plant (non-blooming) vs. soon-to-be dead flowers. Hhmm. Jewelry? Too spendy. Towels … or how about a colorful little throw-rug. Nah. We went past a Valentine’s Day display with candy, cards and bunches of fresh (sort of) tulips. I’m diabetic, so any big time candy purchase, well prob’ly not a great idea, as it’s hard for me to stop on that, when I get going 😛 Just sayin’. The tulips were okay, but Hubs wanted to spend more. Well I was up for that, so . . .
We wanted to keep looking. We were almost to check-out and I saw a young gal with a little mini rose plant. She pointed to yet another display area. Okay, enough already, people. Here is what I chose for my Valentine’s gift. A live and blooming plant. A cute little pink and purple cyclamen. It will bloom for quite a while yet, a week or even longer. And, the foliage will give continued interest until next bloom season (if I don’t kill it first). Next, a bundle of orange tulips (one of my favorite colors and blooms). they got a special “short” vase. Finally … chocolate. Not just any old candy, but … crunchy M&M’s. These happen to be a triple play of pleasure for me! First, one of my favorite things. Second, affordable and third, small so I can have just a few at a time without messing up my sugar #’s (with a little supervision from Hubs)! These all make me smile, and at that $$ amount, I don’t have to feel guilty. It really is true … Little Things can Mean a Lot. Thanks Dugger. Love you still! Happy Valentine’s Day everyone. 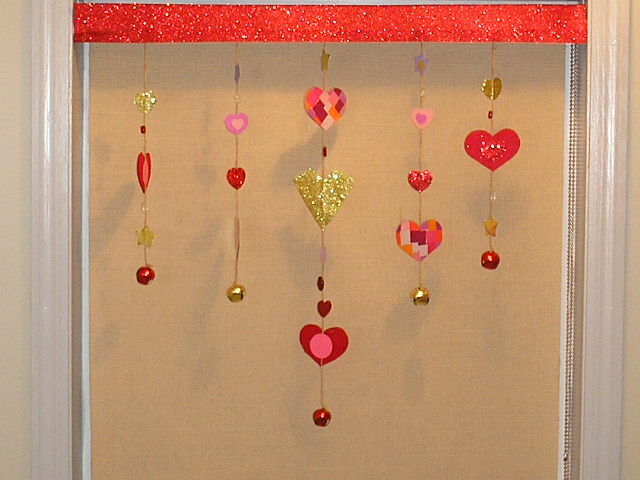 If you still need some decor ideas, search valentine(s) here on the blog, or check out my pinterest and facebook place. Finger puppets and velcro turkeys can be found in my 2013 Thanksgiving post. Everything you need is over there, including the full color printables and easy supply list. Below, the adorable turkeys are only one of the cute ideas you’ll find from Jamielyn Nye’s post over at Baby Center. You’ll have lots of paper projects to pick from over at Enchanted Learning. which lists what a child is thankful for. The project above is both pretty and pretty easy to do. The version below is prettied up even more by just adding some sparkly wrapping paper. Thanksgiving and Christmas holidays together this year in mid-December. Different dates but sentiments are the same. Have a HAPPY THANKSGIVING ! Stay safe until next time.